Cover photo—The approach to the park from Moncton from the northeast is along this road, flanked on one side by a high bank of glacial outwash and on the other by the curving beach. Joel’s Head and beyond that, Owl’s Head, make rocky points beyond the village of Alma. Note how the beach has piled up against the pier in a way which shows that the sand and gravel are drifting gradually from the foreground. One is constantly aware of the natural surroundings in Canada’s national parks for the parks are all placed in areas of unusual natural interest. Entering Fundy National Park from the northwest along Highway 14, one is presented with a rolling, wooded country with brooks and a few small lakes. 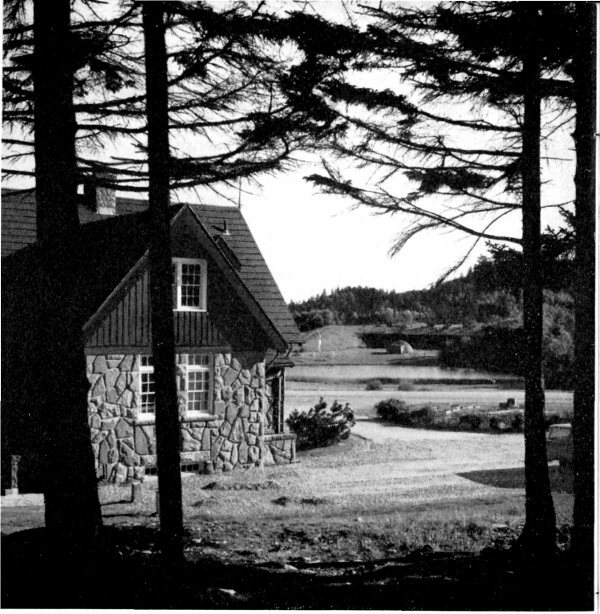 Then, at the top of the hill which leads downward toward the park headquarters and the shore area, a magnificent vista of the Bay of Fundy is spread out below with cliffs and beaches, tidal currents and varicoloured waters, and distant headlands poking darkly out into the sea. If you come into the park from the northeast through the village of Alma, the road crosses the long, covered bridge, then runs along the beach bar to sweep up the curving hill to the top of the natural gravel terrace. A round of golf, a camping trip or a walk along the beach will show still more the natural features. And even a moment’s reflection will show that there must have been a long history indeed to form the rocks, to shape the land, and to cover it with soils and vegetation. This book tells how this happened and of a few places to go in Fundy park to see best the historical record written in the rocks and to see where natural processes are at work even now. The map on page 12 shows where these places are and how to get to them. What to see . . . .
Fundy National Park is in an area of the Maritimes underlain mostly by ancient rocks. These originated partly as sands and muds in old basins where rivers were building deltas, and partly as lava flows and ash beds where volcanoes were erupting and spewing fiery masses of hot rock over the ancient landscape. There are many places in the park where you can see fragments of this very old story. 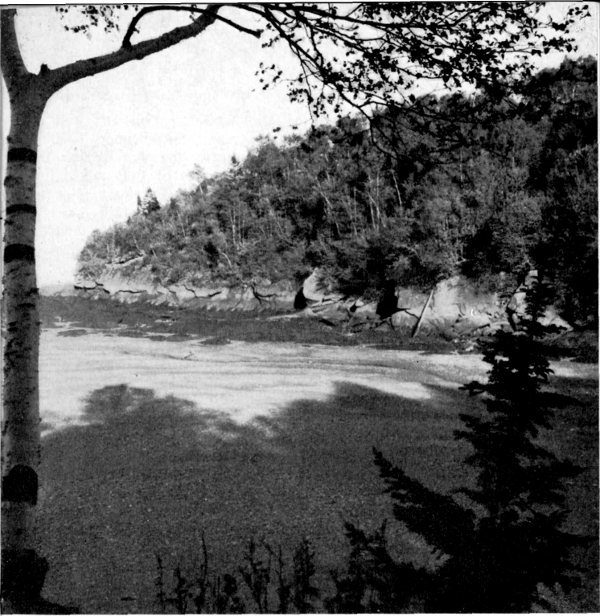 In later geological history, but still millions of years ago, rivers poured gravels and sands with a little mud into lowland areas on the southern fringes of what is now Fundy park. These you may now see as masses of reddish and brown rock between Alma and Point Wolfe. A little later, cleaner sands with fragments of plants accumulated in the same area and these you can see in the cliffs between the swimming pool and Herring Cove. While on the beach looking at the cliffs of rock and banks of gravel you will be aware of the great tides which sweep in and out of the Bay of Fundy, filling the bay to the brim at high tide then leaving the beaches bare and the mudflats exposed at low tide. These great tides are outstanding among all tides on the face of the earth. What tremendous energy must be necessary to move such a huge mass of water. What a powerful flushing-action this movement of water must have on the bottom and the sides of the bay each time it runs its cycle. Beaches are interesting, too, for more than the tides and the cliffs. At Fundy you can see numerous processes at work along the beaches and, further, you can see many different kinds of rocks with different histories. You can note the way the sand and the boulders are separated from one another by the waves and how the flat rock fragments are arranged on the beach like shingles on a roof. You can see where the sand and gravel is drifting from the eroding headlands and you may see, with 3 some thought on the matter, that some of the sand has passed through several cycles in which it has been sand on beaches of another day, passed through a stage of being solid rock, and is now sand again. Back from the shore, in the wooded areas, brooks are busily at work cutting into the rocks and stripping off the cover of soils and surface debris. In some places they have cut deep, rocky canyons and in one place a brook even disappears underground to come out again farther down the valley. Before we look into present-day happenings, however, we should understand something of the long story of development that has led to what we see now, and for this we must go to where it is written—in the rocks. The geological history of the park area can be divided into chapters. The first chapter begins with the oldest rocks, which are also the most widespread. They belong to a group of rocks that extends in a narrow belt across the southern coastal area of New Brunswick, from Saint John to within a few miles of the main road between Moncton and Fundy park, in the vicinity of Hopewell and Hillsborough. They are considered by geologists to have been laid down in the period of time called the Precambrian, which includes a vast span of the earth’s history from almost its beginnings to about 500 million years ago. It can be appreciated that the subdivision of the earliest part of the rock history would be the most difficult, for its record in the rocks is the most obscure. These oldest rocks in the park are assigned to the Coldbrook Group. This is a convenient name used by geologists for the whole group of rocks, and follows the convention that the name given to a group of rocks will be that of the place where it was 4 first described or where it is best observed. In this case it is Coldbrook, just outside the city of Saint John. Now, what kind of rocks are they and what do they tell us? The rocks of the Coldbrook Group, accumulated long ago as lava flows and ash beds, are silts, sand and gravels. It must have been a rough region in those far-off days for the coarse-grained, sedimentary rocks (rocks which at one time were sediments like modern sands and gravels) show that streams were fast-flowing and the lava flows and ash beds show that the region was one of many active volcanoes. These puffed out ashes and cinders and periodically emitted large masses of molten rock that flowed out over the landscape. In regions like Japan and Hawaii where volcanoes are now erupting, we can study the kinds of rock that are being formed. In such recent lavas we find that the rocks are very fine grained with individual crystals less than one-sixteenth of an inch long. Some of them are reddish rocks, others are green or black. In some, a few large crystals with clear sharp outlines (called phenocrysts) are conspicuous in the finer grained rock. Some of the lava flows are full of holes caused by gas bubbles that were present at the time the rock solidified. Some of these holes have become filled with light-coloured mineral material, which washed out of the rest of the rock and precipitated in the holes, to form round amygdules. Where volcanoes erupt with explosive violence they often blow out great quantities of finely ground rock fragments which drift over the land and accumulate, sometimes to great thicknesses. Some of this material is from the walls of the volcano. Because of the violent motion inside the volcano itself and in the air during the eruption, the material is broken to a fine debris. Other parts, however, are pieces of lava that were thrown up into the air in the molten state but cooled on the way down. They were commonly broken into bits either by banging against one another in the air or by the fall to the ground. In the long passage of time since the rocks of Fundy park were hot lavas and ashes and wet sediments, many changes have taken place. The rocks have been subjected to great pressures and shearing. They may have been altered chemically so that the original materials are no longer recognizable. But despite all this, careful inspection will show many of the features of their original state. In some outcroppings in Fundy park the original gas bubbles and the filled bubbles or amygdules are still preserved. In some, the red, green or black colour is still to be seen. Fragments in some of the ash beds still look like fragments. In the sediments, the boulders and cobbles are clearly visible in the ancient rock. Indeed some of the rounded pebbles in the present-day streams of the area were first made into pebbles and rounded by the fast-flowing streams of a billion years ago. When you look at a road-cut and see what seems to be just more rock, you may now realize that it has a long history that may have begun a billion years ago in the throat of a volcano or on a land surface that was worn away by the streams cutting across it long ago. A very long period of time passed before the next event in the geological history of the Fundy area. Geologists are not quite sure just how long it was for there is no completely reliable way of dating these things precisely. Anyway, after many millions of years, masses of molten material oozed up from below and intruded into the volcanic and sedimentary rocks, mentioned earlier, which were part of the earth’s outer framework or surface. These molten materials later crystallized to form light-coloured granite or pink gabbro, and dark grey or black igneous rocks—that is, rocks formed from molten masses. Because all this activity was deep beneath the surface of the earth the cooling was slow, making the grain size much coarser than that of the lava flows poured out earlier in the same area. Nowadays these masses of igneous rock are exposed on the surface in elongated areas which run in a northeast-southwest direction. (See map, page 12.) This may be partly because they were intruded in elongated belts along folded structures in the ancient rocks. The back of the Administration Building shows the flaggy sandstones taken from the beach area just west of the swimming pool. The whole terrace and flat area are on glacial outwash deposits and the pool near the amphitheatre may have originated when a block of ice was covered by the outwash gravels that collapsed when it melted. It has lately been changed during construction of the park facilities. The next chapter, which also is a very long one, seems to have been largely a story of erosion. At times streams wore away the land; at other times, the whole surface was probably below the sea being covered with sediments. Later these sediments in their turn may have been eroded off the old Precambrian rocks. Elsewhere in Canada, Precambrian rocks are succeeded directly by great thicknesses of sedimentary rocks which were deposited by the ancient seas. Geologists have assigned these to four great periods of time called Cambrian, Ordovician, Silurian and Devonian. In Fundy National Park, however, we have no record of these chapters of earth history but the story does resume in the period following—the Carboniferous. Rocks of a kind quite different from those of the ancient Coldbrook Group occupy a strip of the park along the coast between Alma and Point Wolfe. They are reddish or dull maroon conglomerate, sandstone and shale which were, at the time of their origin, red gravels, sands and muds. The pebbles and boulders in the conglomerates are made up of quartz, 8 quartzite, slate, granite and fragments of several kinds of volcanic rocks. This suggests that the area being eroded to provide the sedimentary waste was not unlike that of Fundy park now. The intruding granite and diorite already mentioned must have been laid bare by erosion by this time, for the conglomerate layers contain round boulders of them in many places. These red rocks are overlain by younger sedimentary rocks which are grey, yellow-grey and khaki sandstones with a few conglomerate layers. These sandstones are flaggy to massive and contain numerous plant remains in the form of stems, bits of bark and a sort of chowder of mixed-up fragments. What makes these plant fossils particularly interesting is that they are of kinds of plants that covered this area millions of years ago but which have long since become extinct. In some places small bits of vegetation collected in drifting clumps. Over long periods of time, high pressure and certain chemical changes altered them to the little pockets of coal which can now be found here and there along the shore. 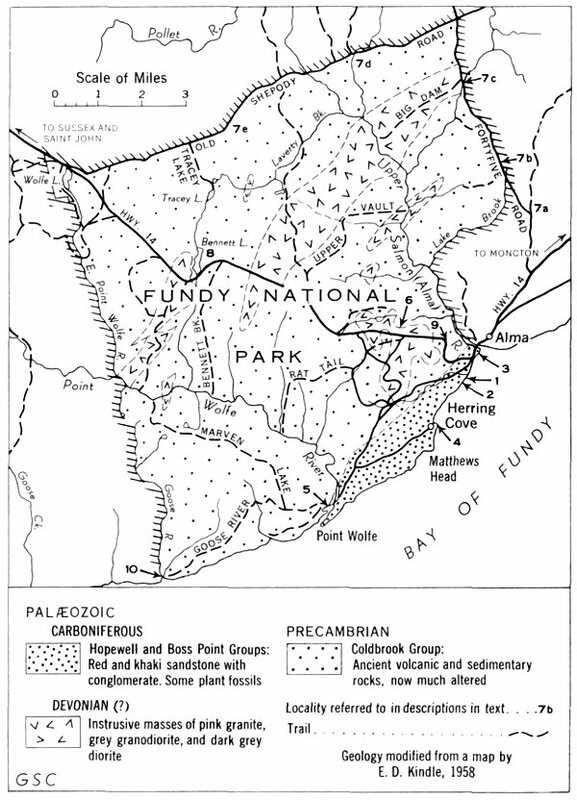 The Fundy park region has no recorded history to account for the 225 million years or so which have elapsed since the end of the Carboniferous period, the last of the rock record in the park itself. In adjacent parts of the Maritimes, though, we know that part of this time, known as the Triassic period, was marked by sedimentation and lava flows but that most of the rest was probably long-continued erosion. Certain periods were marked by folding and faulting of the earth’s crust brought about by enormous compression along the eastern rim of North America. Then further erosion cut deeply into the folded and faulted rocks, eventually exposing, at the surface, rocks that formed at great depths. About a million years ago the climate of northern North America cooled off, allowing snow to stay on the ground the year round. Hundreds of years of accumulation of snow resulted in a great ice-cap that covered almost all of what is now Canada, and part of the northern United States. The ice flowed, by its own weight, over the country, scraping away soils, breaking up and carrying away surface rocks, scouring out river valleys and polishing massive rock surfaces. When the ice melted under the influence of a warming of the climate the debris which it was carrying was deposited all over the countryside. Fundy National Park was covered by the ice-cap, which moved over it from a generally northerly direction. A blanket of glacial till, which is a mixture of angular bits of rock of all sizes, and ground-up rock and clay, covers the park area now. Almost every road-cut shows this material lying on top of the bedrock. When the glaciers finally melted, the remaining debris in them was spread out by the meltwater to form the outwash terrace on which stand the park headquarters, the superintendent’s residence and adjacent installations. One of the consequences of the glaciation is the disrupted drainage now found all over Canada. This is to be expected when you come to think of the scouring of the old valleys by the moving ice and the deposition all over the country of irregular masses of glacial debris. This latter filled in some valleys and turned the streams out of their old courses to flow where they could. It also provided the streams with more than they could carry when they did resume flowing in their old valleys, so their valleys are filled with great boulders and masses of gravels which are not of their own cutting. Several of the brooks in the park have waterfalls on them and others flow in steep-walled, post-glacial canyons. Another consequence of the glaciation was that the enormous weight of the glacial ice on the continent actually bent down the crust of the earth. When the ice melted off the area again, the land was lower than it is now, so much lower in fact that it was flooded by the sea. Since then the land has gradually recovered from the weight of the ice and has risen, leaving some of the marks of the old shorelines high and dry above the present sea-beach level. The superintendent’s residence at the far left is built of stone taken from the beach just west of the swimming pool. The flat terrace on which it and other official buildings stand is made of glacial outwash. The pool, somewhat modified during construction of the park, may have originated by the melting of a block of ice that was trapped in the outwash. Where to go . . . . Walk down to the beach from the swimming-pool parking lot; choose a nice flat boulder and sit down on it. Off to the left you will see the dark sandstone mass of Owl’s Head and the curving beach at Alma. Away across the water a bright red patch in the cliffs marks the occurrence there of Triassic sandstones, which are much younger than any of those in the park itself. If the tide is low you may see a fan of sands and gravels which is really the delta of the Alma River, spread out on the lower section of the beach area and modified by the waves on its outer margin. Still to the left, a high bank of glacial outwash material slopes from the green lawns of the upper level to the beach. One of the things you may notice almost as soon as you come down to the beach is the way the flat slabs of stone lie in relation to one another. As you can imagine, when large waves come crashing in, boulders or slabs with edges turned up are caught by the swirling water and eventually turned over. After this they lie with their flat side toward the waves, and since the return of the water is usually less violent than the on-rush of the breaking waters, it may be that they are not turned back again. Over a period of time the stones on the beach become imbricated, that is, they overlap one another like shingles on a roof. At this beach the effect is quite strongly marked for the sandstone slabs are the right shape and the waves of the right kind. Round boulders could not be affected like this. Nearly all beaches show another feature of interest—they seem to be zoned. Big boulders and rocks lie in one part of the beach, sand and gravel in another, and fine mud and clay in still another section. Now look around this beach and see how the different rocks are arranged. Sometimes the division is very sharp indeed, but at other times gradations exist between the zones. It is something that changes rapidly with every large storm. What about the kinds of rock on this beach? If you chose a flat slab of rock to sit on you are almost certainly resting on a piece of sandstone that came from the cliffs just to the right, or west, of the beach. You may prove this to your own satisfaction by looking carefully at the sandstone you are sitting on and comparing it with the rock in the cliffs, or by observing the shapes and abundance of the sandstone fragments as you leave the cliffs and travel to the left or east toward Alma. You will find that the proportion of sandstone boulders drops off as you go east. The size also decreases, as though the boulders get worn down gradually as the waves pound them along the shore. You will note too that they get rounder as you travel along the beach away from the cliffs. All these suggest that they were derived from the tearing down of the cliffs themselves. If the sandstone boulders come from the nearby cliffs, where have all the others come from? For the answer to this we have to look at the banks of glacial debris on all sides, blanketing the top of the solid rock with mixed boulders, clay, and sand. Where they have been in glacial meltwaters they are bedded or stratified and the separation of sand from boulders and mud 14 may be reasonably complete. Where they have been deposited directly from the glaciers, the materials of all sizes are mixed so that large boulders and fine clay particles are all thrown together in an indiscriminate mixture. You will note that the banks of glacial materials near this beach are of the former kind. A feature of glacial deposits important to this question is the way in which materials from different places are mixed, for as the glaciers moved down over New Brunswick from the north they picked up bits and pieces of rocks from many different places. Thus the glacial deposits, here at the shore of the Bay of Fundy, that have come mostly from nearby, also include a sprinkling of materials from farther away and a few pieces from perhaps tens of miles away. At last we come to the answer to the question about where the boulders and cobbles of stones, other than the sandstones below the swimming pool, came from. They came from the glacial deposits that were derived from the area to the north. They can actually be traced back to their source in some cases. If the boulder is of an unusual rock, and the only known occurrence of that unusual rock lies several miles to the north, then it would seem reasonable that the rock came from that distant outcropping. Boulders of this type, called erratics, are mostly of granite and diorite in this beach and probably came from within 5 miles of the beach zone itself. And now before you leave this beach cast your eyes along the shore to the right, or west, to see the sharp change in the profile of the shore just at the high-tide level. In almost all places where the rocks come down to the sea you will note a change at this line of division. In some places you may note that where the waves wash them, the rocks are generally rounded but above that zone they become sharp and angular in outline. In some places, too, you may note that there is a decided nick point or undercut zone point or undercut zone just at the boundary line. The line of cliffs just to the west or to the right of the swimming-pool beach is of sandstones of several kinds. Before finding what there is to be seen there you should be prepared to watch for falling rock and along this shore take a look at the state of the tide. Although these are not high cliffs or particularly given to slides and falls, one should always be careful about walking under cliffs. Pieces of rock and waste are always coming down in the process of erosion and it is best not to interfere with that process by getting under any of it. Then again the tides here are very high, so watch to make sure that you have lots of time to go along the shore and to get back again before the water rises. The best time to go is when the tide is obviously dropping for it will be several hours before it gets high enough for you to be caught unawares. Now to get to the rocks. You will find that these are sedimentary rocks, that is, they were at one time sands and gravels. Because of this you will find features in them that are characteristic of sediments and sedimentary rocks. First you will find that they are layered or stratified. The layers may differ from one another because of differences in colour, composition or grain size. Thus you will find little layers of pebbles alternating with layers of finely washed sand. You will find crossbedding, or false bedding as it is sometimes called. This forms at an angle to the real bedding as a result of the continuous pushing forward of the edge of a layer of accumulating material in just the same way that you would expect to find some sort of layering parallel to the sloping face of a pile of soil or sand that was being pushed over a roadway to make fill. Because these are related to the piling at the front of an advancing sedimentary deposit they give some idea of the 16 direction in which the ancient currents moved. Thus it can be seen in the cliffs here that the currents in the far-off Carboniferous period moved from the west toward Alma. You may also see that the ancient sands had bits and pieces of plant stems buried in them which now, millions of years later, are visible as marks and imprints. As one might expect, large pieces lie parallel to the surface of the bedding in the sands in the same way that old logs lie parallel to the surface of the mudflats just below where you are standing. Thus on many of the bedding planes, which mark the old surfaces of the bottom or the beach, you will see stems, up to 3 or 4 feet long and 6 inches in diameter, with clearly marked lines and nodes on them. You will also see an abundance of black marks on the rocks without anything very distinctive about them. These are the remains of the driftwood of ancient times with the mixtures of bits of bark and leaves that went with them. The type of plants is interesting because the species represented have been extinct for millions of years. The plant remains you find here all belong to a group of giant rushes, and if you look at one of the better-preserved ones you will note that it has a sort of ribbing or veining parallel to its length and nodes or cross bars which probably represent the places where shoots came off the main stem. You may see during close examination that there really is not much left of the original plants beyond the imprints in the sandstone, although thin coaly films are sometimes found around them. Still another feature in the rocks here is the joints or breaks in the sandstone. The rock, you may already have noticed, is not a single, homogeneous mass but is broken at irregular intervals along more or less smooth faces into large blocks. In some places these are in very regular sets of two or more directions at right angles to one another or at nearly right angles. In others, only one set of joints or perhaps several sets are to be found. In this place you will find a prominent set of joints about parallel to the shore and another less well developed one approximately at right angles to it. Notice how the sandstone is torn out from these joints by the waves and how in the cliffs the rock falls away in blocks which are bounded partly by joint faces and partly by freshly broken surfaces. You may note, too, how surface waters have penetrated the joints and changed the colour of the stone adjacent to them. This imprint of an ancient plant clearly shows ribs and nodes like those on present-day bulrushes. 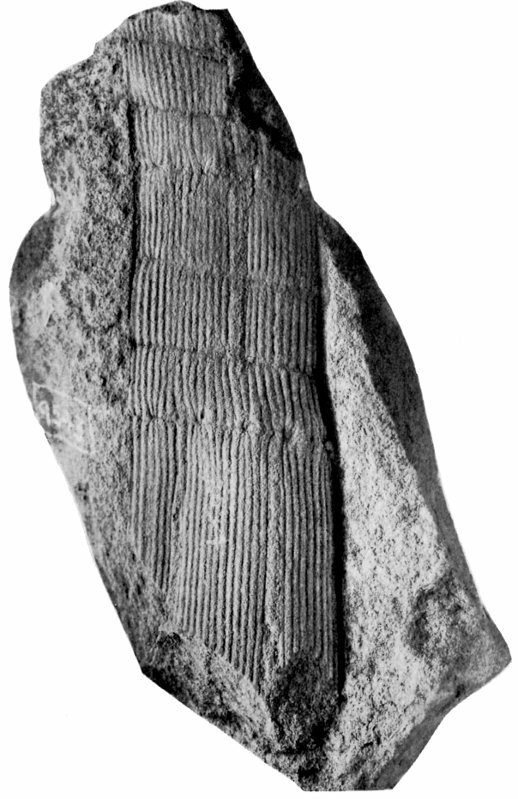 Fossils like this specimen are found in abundance in the sandstones in the cliffs and below them just a few hundred feet southwest of the swimming pool. One of them is clearly visible in a slab of stone just to the left of the front door of the park headquarters. A piece of the sandstone picked up and held close enough to the eye to see the individual grains in it will show a miniature world of minute grains with the spaces between them filled by even more minute particles. Most of the grains in the sandstone at this spot are made of the mineral quartz with a few light-coloured grains of partly decayed feldspar. Silvery flakes of mica are also scattered through it. The greyish or greenish-grey paste between the grains is largely of minute clay particles. This you can prove to yourself by breathing lightly on the rock and then sniffing it for the clay odor. The reason for breathing on it is to add a little moisture which intensifies any odor. In the old days many small quarries were opened up on deposits of sandstone like these to make grindstones. The superintendent’s residence, the administration building and some other official buildings are made of blocks taken from this area. You may note that they are grey and brownish-grey and that some of them are stained along the edges, which shows that they came from joint blocks. If you look just to the left of the main door of the administration building you will see some plant fossils on the surface of the rock. This beach area is essentially a continuation of the one below the swimming-pool parking lot, but in the intervening 19 distance many changes have taken place. The boulders here are mostly of glacial origin with only a few of the sandstone blocks having drifted this far along. The proportion of material of sand-grain size to the boulders is much higher in this area, with the result that sandy areas appear in several of the beach zones. Where the waves come in at high tide in times of storm you can see quite a ridge of sand thrown up. The distribution of sand, mud and gravels is noteworthy here. The flats in the lower part of the beach are mainly of fine particles so that sand flats and mudflats are exposed at low tide. The highest parts of the beach are also of sand and in between is an area of boulders and cobbles. It would seem that a lot of the material in this beach has come from the erosion of the bank of glacial outwash, just to the right or west, along which the road curves up to the level of the administration building. Some of it comes from the cliffs of sandstone beyond. It is intriguing to note that some of the sand grains were once on a beach or in a shallow sea, then were cemented together to make the sandstone in the cliffs and now have been eroded from the sandstone to come to this beach, once again in the form of sand. You may note that the pier built on the west side of the mouth of the Alma River has caused the east-drifting sand and boulders to pile up on one side of it. 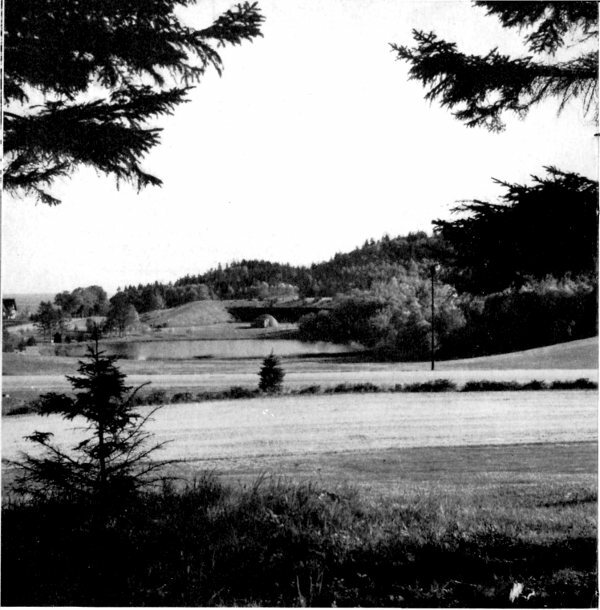 When the first settlers came to the area now occupied by Fundy National Park they noted a patch of reddish soil, between Alma and Point Wolfe, which seemed much superior to that in the country to the west and north. Now we know that 20 this area derives from the decay of the underlying bedrock and is strongly affected by its chemical and physical composition, making for a rich and fertile soil. At Herring Cove, where there used to be farms—as you can see from the remnants of old orchards and the fields—you can walk down to the shore and see these rocks sticking out of the low cliffs. On the right or south side of the cove the reddish rocks are of sands and gravels with an iron-rich, reddish cementing-material. In these rocks you will see bedding and crossbedding. From the beach it is evident that the waves have a rounding effect on the rocks up to the high-water mark, but above this the rocks are angular because erosion is by falling away and breakage rather than wearing and solution. It is easy to see that soils derived from the rotting of these rocks and that glacial debris derived from them would be red. From a position in the middle of the beach you may note that there is a gradual change, from the south side to the north or left side, in the colours of the rocks. The same grey and khaki sandstones which are seen in the cliffs below the swimming-pool parking lot gradually replace the red beds as you travel north toward Alma. If you examine the rocks carefully you may note that this is because the grey and khaki beds lie on top of the red beds and because all of them dip toward the north. The beach at Herring Cove is quite different from others in the park because it is derived from different rocks. First of all, it is quite strongly red. Look at it closely and you may see that many of the fragments are derived from the nearby red beds. Further, many of the fragments are flat—a result of their coming from the breakage of flat-layered beds. Waves make patterns of these flat chips on the beach. The tide is out at Herring Cove leaving the weed-covered rocks and the beach quite dry. Wave-action rounds and softens the outlines of the rocks below high-tide level but leaves the jagged outlines above. The beach here is very red because the fragments that make it came from the red rocks nearby. The late afternoon sun casts long shadows. The main park road into the Point Wolfe area follows a well defined valley which continues out under the salt water. This valley and inlet mark the boundary between the younger Carboniferous rocks and older Coldbrook rocks of Precambrian age. It is very common for rock boundaries to be marked this way for the agents of erosion, such as the waves of the sea, rivers, and glaciers, are able to wear down the rocks along such discontinuities more rapidly than solid, unbroken rocks. In this case it appears that there is also a fault or break which further assists this differential wearing away by producing broken and cracked rock at the edges of the two rock types. The road down to the beach at Point Wolfe Cove cuts through glacial outwash containing a great variety of boulders in a sandy matrix. The beach itself is composed of a mixture of the glacial outwash, the products of wearing away of the old volcanic rocks along the shore to the west, and reworked sand and pebbles derived from the red Carboniferous rocks to the east and south. The different appearances of the two sides of the cove are quite striking. The little bar which forms most of the beach area in the cove is the result of a delicate balance between the action of the waves, the tidal currents and the river coming in at the back. Each varies with the season, the tides, and the wind, so that on any one day the bar may be eroded or added to, straightened out or recurved, steepened or planed off. When we think of the delicate adjustment, we must also remember that much more change is brought about in one storm than in months of calm weather. Perhaps the few wharf posts sticking out of the mudflats nearby will remind us, too, of how temporary are the works of man. The trail winds over gently undulating country from the highway to the steep valley of Kinnie Brook. A spring of cool water bubbles out of the ground in a small depression part way along and is the head of a small brook. This is water which has fallen on the higher land beyond in the form of rain and then percolated slowly through the sands and gravels to emerge at this low place. A little farther on, the trail splits into upper and lower, or east and west branches. The east branch leads to the edge of the inner, steep valley of Kinnie Brook and then descends steeply to the water level. Here the rock is a light and dark speckled igneous rock called diorite. In the brook bed, large boulders of this rock seem to have been dumped in all positions. This is probably partly because they have been eroded from the walls of the valley and have fallen into it and partly because some of them are glacial boulders which have tumbled into the valley. Walking upstream you can see that the dioritic rock becomes more and more filled with pieces and chunks of the old volcanic rocks. These inclusions were probably digested or partly absorbed by the igneous diorite when it was intruded as a molten or fluid mass. About a fifteen-minute walk up the brook through the deep woods, where the brook falls over ledges and between boulders, takes you to a place where the brook seems to emerge from the rocks with a dry valley above. Still farther up the valley nothing is seen of the brook at all except for a few pools and marks on the rocks which show that water passes that way at some seasons. Eventually the valley leads to a flat; the end of the other branch of the nature trail comes down the hillside on the left or south side of this flat. The upper end of the fault is gravelly and has a brook coming onto it, but about halfway along it, the water seems to disappear into the ground. Some ingenious local resident has 24 called this whole thing ‘the Strainer’, for the brook disappears below the gravel and boulders, into subterranean channels, to emerge eventually several hundred feet downstream. The west branch of the trail leads over a great boulder fall as you go up or down the side of the valley of Kinnie Brook. Each boulder is covered with a blanket of peaty forest-litter which has accumulated over the years. This often hides bad holes between boulders but the trail itself is well worn here and is not dangerous. From the shoulder of the valley on the west branch of the trail one can see the sharply marked inner valley of Kinnie Brook. It is likely that the more gently curving upper part of the valley is older than the glaciation and that the inner, steep-walled part has been cut by the brook in recent, post-glacial times. If you should take the day to see some of the back country along these roads you may note a few items of geological interest on the way. 7a. Forks of the road, 1¼ miles above the turnoff to the main Alma-Moncton highway (No. 14)—This is the edge of the plateau country on which most of Fundy National Park is located. The rolling upland on top is the remnant of a nearly flat area developed at a time when the country was much lower than now. During the vast length of time that it was at this lower elevation, streams and rivers planed it nearly flat. Since that time, millions of years ago, the whole eastern seaboard of North America has been uplifted. Streams have been cutting into the uplifted surface, making it very ragged and, indeed, removing it altogether in many places. Because the old volcanic 25 rocks of the Coldbrook Group are so resistant, parts of uplifted plateau are still preserved. This spot is just about on the edge. You will note the sudden change in the gradient of the road. Glacial debris is everywhere and you may wonder what the stony soils could possibly be good for. The abandoned farms and the fairly thick forests provide the answer. 7b. 800 feet north of park entrance and warden’s residence—Gently rolling country with shallow valleys and lots of flat areas are typical of this part of the plateau. In the ditches here you may note a continuous display of glacial deposits. The boulders are flattened and polished by wear in their movements in the ice and on its bottom. They are of a variety of rock types and include reddish granite, blue-grey conglomerate and fine-grained sedimentary rock, some altered lava-flows which are mostly grey, and some speckled black and white diorite. Most have not travelled very far to get here but a very small percentage have come tens of miles. 7c. Covered bridge on 45-Mile River, north end—Pink granite, an igneous rock which was squeezed into the surrounding rocks when molten, outcrops along the road to the north of the covered bridge. A great increase in boulders of granite in the glacial drift may be noted as well. This proves that much of the glacial deposits did not travel far from where they were ripped out of the solid bedrock. 7d. Upper Salmon River bridge—Old lava-flows are exposed in the stream here but, because of the many changes wrought in them over the millions of years, they bear little resemblance to the original rock. The boulders, cobbles and pebbles in the stream bed include many varieties of granite, some grey and green volcanic rocks and a few of reddish sandstone. 7e. Soft slates and schists—On the roadside south and west of the junction with an old road leading north, and near the change in direction of the main road, several outcroppings show what happens when rocks are almost completely altered from the original lavas, ash beds and minor sedimentary rocks. These rocks—soft slates and schists—formed when the constituents of the original rocks had been completely changed chemically to produce completely new minerals. These minerals are in the form of minute flat sheets and altogether they impart to the rock a foliation or parallel breakage. You may also note that the rocks are shiny on the flat surfaces and dull on the edges. Lakes are seldom found in countries that have not been glaciated for they are but temporary things in the scheme of erosion. The outlet brook is constantly cutting away at the one end to drain the lake and the inlet brooks are constantly filling in at the other end with mud and silt. In recently glaciated countries many lakes are still to be found where old valleys are dammed by dumpings of glacial debris, and brooks have not yet had time to drain the lakes. Bennett Lake is on the site of a much smaller natural lake which was made by the glaciers long ago. A man-made dam has raised the water level considerably, making the island smaller and backing the lake farther up the valley. Just below the dam and on the side of the road, a scar in the hillside shows a large expanse of glacial debris, large quantities of which were removed in construction of the roadway nearby. 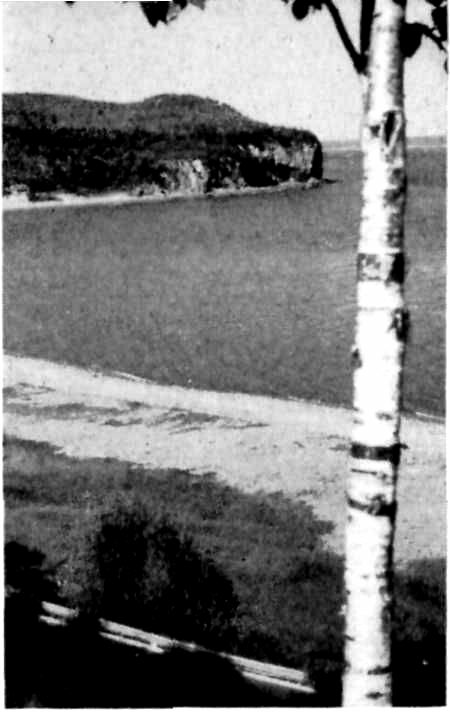 From this spot the view is magnificent, with the shore below and the tidal flats, the mouth of the Alma River and the park greenery, and with the sweep of the upper reaches of the Bay of Fundy visible on clear days. The old orchard nearby, with the neat piles of boulders, slopes down from the brow where rocky outcroppings line the roadway. Now let’s sit down in the grass and think about how the beautiful view got that way. The rocky outcrops along the road are of the old volcanic sequence which covers most of the park area. It has different colours in different outcrops but pale brownish grey or buff is about average for this area. The rocks here include some igneous masses that were intruded into the older volcanic rocks. These you can see in the outcrops on the south side of the road, westward from the volcanic rocks. The intrusive rock is a speckled diorite, with light and dark minerals in about equal proportions. The surface of the area is covered with the inevitable glacial cover of mixed boulders and fine-grained materials. Most of it is grey or greenish-grey volcanic material from nearby but with a few fragments from afar. It is interesting to note that these piles of boulders, so laboriously gleaned from the fields by the pioneers in this area are only to be found in glaciated regions, for it is only in glacial deposits that boulders of fresh rock are to be found in the soils. The soils themselves are very little changed since they were deposited from the glaciers. It is for this reason that the soils are not very fertile; the chemical changes that make various compounds available for plant food have not yet had time to take place. Down below are the shoreline and tidal flats. At high tide there is little to see of what lies underneath, but at low tide 28 the delta of the Alma River, the wave-washed muds and sands, and the distribution of the debris worn from the eroding cliffs are there for examination, as we found on the beaches. Farther out in the bay the water is often streaked with zones of slightly different colours. These are probably tidal currents with streaks of clear water and streaks of water coloured by muds and silts stirred up from the bottom or from the shoreline by waves. Perhaps, from this vantage point where we can spread our view out over a large part of the bay, we should also find out what makes these tides, and especially here in the Bay of Fundy, what makes them so high. Most people are aware that tides are caused by the gravitative pull of the moon on the earth. Because the water is fluid and can move quite quickly it is pulled up into a bulge on the side of the earth nearest the moon. A corresponding bulge appears on the other side of the earth farthest away from the moon making a balance for the earth’s rotation. The moon moves very slowly around the earth, taking a whole month to make the circuit. If this were the only motion then the tides would come in and go out only twice a month, with each of the two bulges making a separate high tide. But in addition, the earth turns on its axis once a day. With the tidal bulges always nearest the moon and farthest from the moon, and the earth’s rotation once a day it means that the tides will be twice a day as each of the tidal bulges passes a particular point. The times of the tides will gradually change during the month as the moon slowly changes its position. On the open ocean the tide is not much more than a couple of feet. But in many places along the shores, the shape of the land and the slope of the bottom greatly influence the local effects of the tides. You can easily see that landmasses interfere with the tidal bulges. In some places where large seas have only small openings to the open oceans, the tides are very small. 29 Thus the Mediterranean has very small tides indeed and as a result the Greek and Roman philosophers knew virtually nothing about them. On the other hand the heights of the tides are vastly emphasized in some other places. The Bay of Fundy is one of these places. Several factors probably contribute to the high tides in the Bay of Fundy. You have probably seen how the water in a partly-full washtub can be made to splash over the sides by very gently tilting it, then tilting it again and again in just the right rhythm so that each successive tilt comes in time to give the waves, started by the earlier tilts, a little extra shove. It seems that the shape of the Bay of Fundy is such that the twice-a-day tidal bulge comes across its mouth at just the right time to be in rhythm with the previous wave. Thus the small tidal push is emphasized because of the repeated pushes at just the right time. So the tide increases from three or four feet at the outer end of the bay to several tens of feet in the inner end of the bay. Another factor of some importance is the funnelling of the advancing wave. If you take two planks and put them on edge in a pool of water so that they converge at one end, forming an open triangle, and start a wave at the other end, you will see that the wave becomes higher and higher as it is restricted by the converging boards. In some parts of the Bay of Fundy this effect is very strong and serves to increase the already very high tides. Now you may look with different eyes on the rising tide as you realize that here is a tiny part of the vast rhythm of the worldwide tides, emphasized in the Bay of Fundy by its shape, and by its size which allows it to oscillate at just about the right frequency. Thus those streaks of coloured water and the mudflats, the exposed seaweed and the current rips are related to the earth’s rotation and the position of its satellite moon. This beautiful spot is reached by a road that runs along the edge of the plateau not far back of the cliffs (except where it goes up a valley to cross the two branches of Mile Brook). Along it, rocks of the old volcanic division are exposed in several places, broken and twisted at First Mile Brook, red and massive at Second Mile Brook, but everywhere close to the surface. Farmers actually scrabbled a living from these thin stony soils in former days. Old volcanic rocks of the Coldbrook Group are on all sides of the mouth of Goose River. Its valley is cut deeply into them along the edge of the plateau land which makes up most of Fundy park. The sand on the beach and the boulders and cobbles are almost entirely derived from the shore erosion of these old volcanic rocks. The result is that a handful of sand examined closely will show a beautiful mixture of greys, reds and greens. Epidote is a green mineral commonly formed from the alteration of volcanic rocks and it is found abundantly in these sands. Reddish and grey fragments are minute pieces of lava flows. Shiny flakes of silvery or greyish-green chlorite come from volcanic rocks that have been sheared and altered. Some glacial contributions are also present. This beach is, like the one at Point Wolfe Cove, the result of a delicate balance between the inwash of waves and currents, the inwash and outwash of tides, and the outwash of stream waters. Thus in times of storm, when the balance is shifted in favour of the larger waves, or when the tides are very high and very low, or in the spring when the amount of water coming down the Goose River is extra large, the balance is altered and the bar changes. Note how steep the bank is on the west side where waves tend to pile up the sand and the tidal currents scour it to keep it open. When you have visited these places and watched the natural processes at work it is difficult not to feel something of the majesty of nature, and the endless struggle between different forces to reach a balance. The seas are tearing away the land but the surface of the earth is in a constant state of adjustment, up and down, so that new parts are being presented to the sea and old sea bottoms uplifted. Streams wear away the land as they cut their valleys but their valleys are cut into sands and gravels that once before were worn off a land surface. Where volcanoes once spewed out molten lavas, quiet forests now prevail. Where men are now camped was once the site of igneous intrusion. And, at the present time, the processes are still at work all over the face of the earth—tides are coming in and going out, the streams are eroding the land, waves are cutting into cliffs, volcanoes are belching, mountains are being uplifted and glaciers are moving in their solid masses down to the sea. Geological Map of Canada, 1045A. Ottawa, 1955. Geological Survey of Canada. Geological Map of the Maritime Provinces, 910A. Ottawa, 1949. Geological Survey of Canada. Geology and Economics Minerals of Canada. Ottawa, 1957. Geological Survey of Canada. Economic Geology Series No. 1. Waterford, East Half, Map 1109A, by E. D. Kindle. Ottawa, in press. Geological Survey of Canada. 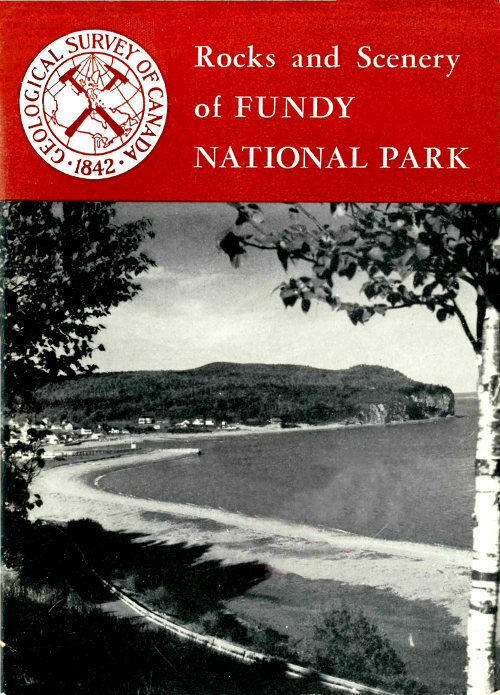 Includes geology of Fundy National Park and adjacent area to the west and north. Guide to Geology for Visitors in Canada’s National Parks, by D. M. Baird. Ottawa, 1960. 144 pp., 37 illustrations. National Parks Branch, Dept. of Northern Affairs and National Resources. This is designed to be a general introduction to the principles of geology in layman’s language with special emphasis on Canada’s national parks. For other information concerning national parks in Canada apply to the superintendent of the park concerned or write to the National Parks Branch, Department of Northern Affairs and National Resources, Ottawa, Canada. Numbers correspond to numbered localities on the map. Copyright and publisher’s information was included from the printed copy: this eBook is public domain in the country of publication. Some palpable typographical errors were corrected.